This is a busy time for board members and other municipal officials in Upstate NY. They've got til the end of December to submit their comments on the NY Department of Environmental Conservation (DEC) draft Supplemental Generic Environmental Impact Statement (SGEIS) regarding horizontal drilling and hydraulic fracturing in Marcellus and other shales. This is not a trivial pursuit; the Town of Danby's comments spread over 20 pages. But even as public officials try to beat the comment deadline, thousands of others are calling on Governor Paterson to withdraw the SGEIS. Last week over 100 people attending a meeting in Ithaca signed on to the letter, and they're hoping to get another couple thousand over these next few days. Their reason? The SGEIS presumes that the 1992 Generic Environmental Impact Statement for oil and gas drilling - a document that took over a decade to produce - adequately protects human health and the environment. But it doesn't, says Walter Hang of Toxics Targeting. The current regulations fail to adequately safeguard citizens against impacts on water quality, land use, economic and cultural resources and wildlife - and he has 270 cases of spills and accidents to prove it. Regulations for current gas wells aren't protective enough and the industrial nature of drilling in the Marcellus will create multiple opportunities for even more environmental problems. The SGEIS would allow huge impoundments for flowback and brine - and already PA's Department of Environmental Protection (DEP) has slapped a couple corporate wrists for poorly engineered impoundment structures. Then there's the problem of wastewater. “Where will it go?” Hang asks. Public wastewater treatment plants in NY aren't equipped to deal with the high levels of dissolved solids in the brines. Nor are public treatment plants set up to deal with the radioactivity expected to be in Marcellus brines. Instead, NY drillers have been transporting millions of gallons of brine and well wastewater to Pennsylvania and Ohio. But at the last DEC hearing in Corning a Pennsylvania man said, "don't send it to us. We don't want it." “The bottom line,” says Hang, “is that the [NY] government is not safeguarding your public health and safety. That's why he is actively circulating the petition that asks Governor Paterson to withdraw the SGEIS. "That action will allow the de-facto moratorium on drilling permits to continue," Hang says, and a continued moratorium will allow towns and citizens more time to push for stronger environmental cleanup protections. As of last Monday, nearly 2,000 people and organizations had signed on to the letter. Now it's your turn. Anyone concerned about the flaws in the proposed rules (even folks outside NY) can read the letter and sign on right here. And if you can get a few celebrities to sign on, so much the better! You'll also find an interactive map and the profile of 270 oil and gas spills at that site. And check out the facebook page "no fracking way". Since July, and throughout three public hearings, residents of Horseheads, NY and the surrounding area have been asking the village elders to conduct a more thorough environmental review of the proposed Schlumberger building project. Last winter Schlumberger Technology Corporation plunked down a chunk of change for 88 acres in the Horseheads Industrial Center. It is an area zoned for light industry and manufacturing and contains warehouses and distribution centers. There is also another gas field service industry on the site - a company that provides equipment needed for drilling. Schlumberger hopes to construct a 400,000 square foot facility to store fracking chemicals and explosives needed for gas field development. And they claim that their facility will bring 300 to 400 jobs to the area. But residents are concerned that local municipal officials have embraced potential economic gain at the cost of potential environmental contamination. During the public hearings they repeatedly expressed their concern to village board members that it seemed like the project was a “done deal”. They begged the town board to conduct a more complete environmental review. In particular, residents raised questions about stormwater permits, air quality and the impact of increased truck traffic on adjacent schools and residential neighborhoods. This decision cleared the way for site plan approval and outraged many local residents. Outraged them so much that on November 12 a group calling itself People for a Healthy Environment filed a lawsuit against the Village. They claim that approval of the Schlumberger project was “illegal, arbitrary and capricious” and ask that the project be halted until more a complete environmental review can be done. Horseheads Village didn’t just give a deaf ear to the people. They – and Schlumberger –also ignored demands from the state Department of Environmental Conservation (DEC) to cease activity on the site until certain requirements had been met. 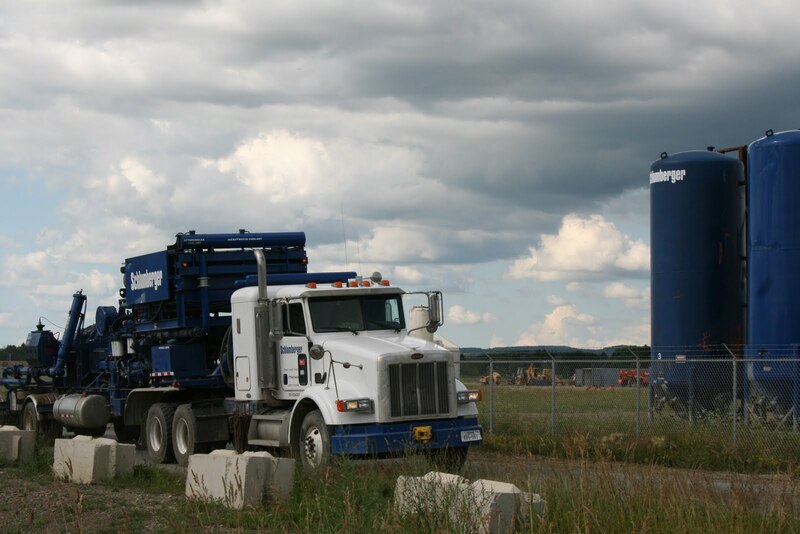 Since summer Schlumberger has been operating on the site, with permission of the Village. They have a temporary structure, chemical storage silos as well as trucks parked on the site. Still, Schlumberger insists that what they are doing is not "construction" and therefore requires no permits. The NY Department of Environmental Conservation (DEC) is not amused. On September 30 the DEC issued a Notice of Violation to Schlumberger for failure to obtain proper permits for stormwater discharges. You see, stormwater from the Schlumberger site discharges into a NY state freshwater wetland and into Catherine Creek, which eventually spills into Seneca Lake – precisely the concern raised by residents at board meetings and public hearings. DEC directed Schlumberger to: discontinue all chemical and material storage; discontinue all construction support, maintenance and storage operations; and discontinue all storage and maintenance for vehicles providing oil and gas field services. Schlumberger’s response was to continue their activities at the site. Until recently. It took another letter from DEC, but according to Peter Lent, regional permit administrator for DEC, as of November 13 Schlumberger is honoring the cease work directive. In the meantime they are trying to get a stormwater permit for their temporary site. It won’t be easy. In an 8-page letter to Schlumberger, DEC listed a number of things Schlumberger needs to clarify before a permit will be issued. Schlumberger needs to make sure chemicals are stored correctly; an October 15 inspection revealed a tarpaulin roof leaking water onto chemicals stored on pallets. It also cited chemical and additives dust on the storage building floor. DEC has also requested Schlumberger to be more forthcoming about the chemicals stored on site. Instead of lumping them together in a broad category, such as “dry additives” they will need to list the components of the mixture. As for the citizen lawsuit, the group expects a response from village officials sometime in December. You can read about the October public hearing here . You can read more articles about Schlumberger here. Here's some updates from a few of my colleagues found on The Gathering Line. The Gathering Line is a round-up of oil & gas drilling news brought to you by National Alliance for Drilling Reform (NA4DR), a broad alliance of grassroots activists from states across the nation that are affected with drilling development. Amy Goodman interviews of Toxics Targeting, an Ithaca, NY-based environmental database firm which released a report last week, uncovering 270 documented hazardous chemical spills which occurred over the past thirty years. PA's own Department of Environmental Conservation's database contained records of fires, explosions, wastewater spills, well contamination, and ecological damage related to gas drilling. Take a moment to watch the interview Amy Goodman Interviews Walter Hang of Toxics Targeting Mr. Hang is calling on NY Governor David Paterson to withdraw the Draft Supplemental Geologic Environmental Impact Statement, citing woefully inadequate reporting which will not come close to protecting the environment, water, and public health. This is a must-see interview! Visit Gas Wells Are Not Our Friends to find out more from Peacegirl! Would you consider this a small footprint?See the effects of 40 years of drilling!Read it at Cheap Tricks and Costly Truths. Gas drilling is destroying Pennsylvania's wilderness. The Pennsylvania Wilds include more than 2,000,000 acres of publicly owned virgin forest, clear mountain streams and abundant wildlife. Read about how these public lands are being violated and watch for public action you can take soon to defend the Allegheny National Forest, part of the Pennsylvania Wilds. TXsharon continues to follow the abuses of Aruba Petroleum in a Barnett Shale backyard and Wednesday the Wise County Messenger picked up the story--don't miss the comments. It's all on Bluedaze: DRILLING REFORM FOR TEXAS. The current message to landowners situated over the Marcellus shale is that if they want to lease their land for good money, they need to provide a way for the gas company to get the gas out and send it to market. That means allowing drilling on their land and allowing pipelines. It also means allowing gas compressor stations, and over the past summer Chesapeake Energy constructed a new and larger compressor station just a few miles from here. Gathering lines from six local wells carry natural gas to the station on Federal Road in Erin, NY. The compressors increase the gas pressure so it can be pushed into the Millennium Pipeline (which carries the gas off to NYC). Chesapeake threw the on-switch last month and already two of the nearby neighbors are complaining about the noise. And it’s not just the noise that bothers Usack. “At night it’s lit up like a Christmas tree,” he said, and those lights shine into his windows all night long. Usack has called Chesapeake a couple of times about his concerns, and they’ve sent someone down to measure the sound. But they don’t share the results with Usack. What really bothers Usack, though, is that the town didn't have a site review or notify neighbors about the project. Sure, he sold the one-acre parcel to Columbia a few years back - and Columbia sold it to Chesapeake - but Usack didn’t realize they would use it for such a large compressor because the town has zoning. And that area is zoned residential/agricultural, not industrial. The compressor, he says, is industrial in nature. According to the Town Code Enforcement officer John McCracken, Chesapeake, already had an existing compressor there. Therefore, they were exempt from everything except the building permit for the structure surrounding the compressor. Flipping through the blueprints on his desk, McCracken reads off a few design specifications: a hospital-grade muffler; estimated engine power around 700 hp; noise level expected to be 40 decibels at the site. Oh yeah, and it's powered by natural gas. More about that later. This is becoming a problem south of the border, in Bradford County, PA. Brian Davis, Bradford County planner, says the county has no zoning and already there are three compression stations. He expects more to come. Residents may have little say about where a compression station goes, but that doesn’t mean they’ll keep mum. When people complained about the noise at a compressor station near Albany, the company installed acoustic blankets inside the compressor station buildings to help muffle the sound. Right now nobody in Erin is thinking about potential air quality concerns. That's because there's only one compressor in town. But Calvin Tillman, the mayor of Dish, Texas, warns that emissions from gas-powered compressor stations like the one in Erin have the potential to pose serious problem. In a phone interview last week he explained some of the problems Dish residents were experiencing. But we have eleven compressor engines, he emphasized. The problem is, they are located just outside the town boundaries, and just beyond town jurisdiction. Dish has no control over where those compressors are located. "Texas allows the companies to permit each station separately," Tillman explained. It's done with "permit by rule". As long as each compressor does not reach or exceed the allowable emissions threshold they are permitted. "They don't consider the cumulative effect of all the compressors in the area," he said. Earlier this week The Endocrine Society released a news blurb noting that the American Medical Association may be closer to working with the federal government to enact new policies to decrease our exposure to endocrine-disrupting chemicals (EDCs). Given that frack chemicals contain EDC's, any effort to reduce public exposure is welcome news. According to the Endocrine Society, the resolution states that the AMA will work with the federal government to pursue regulatory oversight of endocrine-disrupting chemicals. Regulations, they say, should pass through a single office to ensure coordination among agencies - with the exception of pharmaceutical agents that are regulated by the Food and Drug Administration and are used for medicinal purposes. The resolution also requires that policy be based on comprehensive data covering both low-level and high-level exposures and that national policy should be developed and revised under the direction of a collaborative group comprising endocrinologists, toxicologists, occupational/environmental medicine specialists, epidemiologists and policymakers. You can read more here. If you ask folks around here (Upstate New York) what concerns them about gas drilling in the Marcellus shale, contamination of drinking water and groundwater aquifers usually tops their list. Given the number of brine spills already documented by DEC, not to mention the three frack chemical spills about two months ago just over the border, and you begin to understand the concern. Cabot Oil and Gas had three spills at two of their wells. Eight thousand gallons of a water/gel frack mixture oozed across the soil and into Stevens Creek and into a nearby wetland. DEP slapped Cabot's hand, ordering them to halt operations for a couple of weeks and fining them $56,000 and change. But still, 8,000 gallons is a lot of frack gel to spill on the ground. That same month Brad Gill, executive director of IOGA-NY tried to ease people's concerns about the potential contamination of water from chemicals used in hydraulic fracturing. “These chemicals are no more dangerous than those found in personal care products and laundry detergent,” he said at a public meeting in Corning, and flashed a slide of the Materials Safety Data Sheet for a common household cleaner on the screen. His point? That people use products containing chemicals similar to those used in fracking fluid every day. Brad isn't the only one to compare frack chemicals to the stuff you wash your face with each morning or toss in with the diapers. Christopher Helman, writing in Forbes last month, noted that the acids, surfactants, petroleum-based lubricants, corrosion inhibitors and microbe-killers are "basically the same carcinogenic chemicals found in household cleaners Formula 409 and Drano." So maybe we shouldn't drink it, but basically it's not scary stuff. But many of the chemicals in the shampoos, cosmetics and household cleaning products contribute to cancer. They contain chemicals that mimic hormones - such as estrogen - and these synthetic chemicals disrupt normal hormone behavior in our bodies. There are environmental estrogens in shampoos, body lotions and sunscreens; they may be absorbed into our bodies through the skin. And cleaning products and laundry detergents may contain nonylphenol polyethoxylate, a surfactant that breaks down into an estrogen mimic. But there's a whole lot of difference between the 32-ounces of detergent I might spill in my laundry room and the 8,000 gallons of gel Cabot spilled in PA.
To read more about laundry detergent, fracking chemicals and cancer click here. 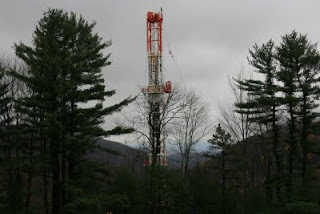 For the past 18 months or more the NY Department of Environmental Conservation (DEC) has steadfastly clung to their mantra that there have been no drilling accidents in NY. Ever. And we've had lots of experience with drilling, they say, noting that since the 1800's there have been close to 70,000 wells drilled in the state. Furthermore, many of these wells have used fracking, they add, claiming that what was safe in the past few decades will continue to be safe for the future. Apparently they forgot about the 270 drilling accidents reported in the last three decades. Walter Hang, who owns a small research company called Toxics Targeting recently posted a file to his website listing 270 incidents of wastewater spills, well contamination, and other ecological damage related to gas production since 1979. Hang, who has also mapped TCE plumes in the local neighborhoods in Ithaca, NY, is an environmental advocate. While he's never come out against gas drilling, he has said on many occasions that there are environmental risks, and has asked for public disclosure by DEC on well accidents. They didn't; Hang did, and now we can read all about it. The interesting thing Hang noted is that of the 270 incidents he posted, DEC only caught 60 of them. The remainder were reported by citizens - people who were involved in the incident or folks who just happened to notice something looked wrong and called it in. Hang's release of this data comes just as DEC announces a 30-day extension for comments on the draft Supplemental Generic Environmental Impact Statement (dSGEIS) for horizontal drilling/hydrofracking in the shales. You can find that 809-page document on the DEC website. It also comes on the heels of an announcement by PA's Department of Environmental Protection fining Cabot Oil and Gas $120,000 for damages and ordering the company to restore or provide a permanent alternative for the drinking water wells destroyed by methane migration earlier this year. You can read the full announcement here. November 1996- a resident in Freedom complained about a problem with drinking water from his home well. He thought it might be related to the gas drilling over on Bixby Rd about a mile from his house. The DEC investigator commented that gas escaped through a fault in the shale and affected properties 1 and 1/2 miles away. He found gas bubbling up in ponds and ditches, and they evacuated 12 families. The problem? An equipment failure. The penalty? None. October 1997 in Willing, NY - a brine tank overflowed spilling 15,000 gallons which flowed through a field and into a local creek. The brine spill killed vegetation, and a local farmer was concerned about his cows drinking from the creek. Solution: gas company erected a fence so cows wouldn't get to creek and provided temporary water supply. They decided to let natural vegetation grow back following season. The problem? A faulty valve. The penalty? None. The problem? A broken valve. The penalty? Oh, come on.... do I have to really say it again? On Oct. 27 Andrew Blocksom presented his plans for a frack fluid treatment plant to the Town of Owego Planning Board and was told to do a bit more homework (see Oct 28 entry). Patriot Water Treatment LLC had submitted a site plan and a "short-form" Environmental Assessment Form" (EAF). The "short form" is indeed short - only two pages in length. Instead of the 20 or so questions about environmental impacts on the longer form, there are only seven concerning potential adverse action on the environment. At the meeting the planning board asked Patriot Water to provide more details - and complete the longer EAF - before bringing the proposal back to the board. Which, Blocksom says, they are working on. He also says that he is working with the DEC to figure out what other permits may be required, as the type of treatment facility he hopes to build is very different from anything they've permitted. Apparently DEC is going to ask for some air quality information as well. The biggest concern voiced by both residents and planning board members last week was the lack of detailed information about the recycling treatment process. Blocksom’s overly simplified description left people wondering what happened to the frack fluid when it entered the facility and where would the solids and salts be stored after their removal from the drilling waste fluid. People also wanted more details about the proposed impoundment and what actions Patriot Water Treatment would take in the case of a spill or a flood. Perhaps the thing that bothered people the most was Blocksom’s continual reference to frack waste as “non-hazardous” and “non-toxic” material. When Blocksom submitted his plans to the town, he included some information about equipment developed by Aqua-Pure Ventures Inc., of Calgary, Alberta, and implied that Patriot would be leasing from that company. So I called up Aqua-Pure and spoke with Patrick Horner, the lead engineer. The facility proposed for Taylor road will employ a process called “mechanical vapor recompression evaporation” (MVR) said Horner . He explained that Aqua-Pure already has nine well-site units using this process in Texas and they are working with Eureka Resources in Williamsport, PA to establish a permanent facility much like the one proposed for Owego. IF Patriot does indeed use the NOMAD units built by Aqua-Pure, the frack fluid will go through a series of stages. During the first stage the pH (acidity or alkalinity) of the water is adjusted. This is when metals and solids precipitate, or drop out of the frack fluid. The solids go through a de-watering process and, once they are dried into cakes, transported to an industrial waste facility. Meanwhile, the remaining liquid is subjected to the MVR process to reduce the salts. One of the problems both Blocksom and Horner raised is that fluid with extremely high levels of salts, above 80,000 to 100,000 parts per million (ppm), are hard to distill. 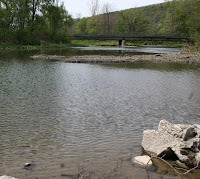 “And the Marcellus wells tend to have higher levels of salinity in their flowback,” Horner said. Fluid that has low salinity, and distilled water resulting from the treatment process will be trucked back to the wells for use in fracking. The NOMAD isn't the only type of unit available, and Aqua-Pure isn't the only company developing this technology. In a telephone conversation today, Blocksom indicated that his company is considering other companies as well. With 20 tough questions to answer and some research to do, it's not likely that Patriot Water Treatment LLC will be ready with an updated proposal in time for the November 24 planning board meeting. A buncha local musicians pooled their resources (no compulsory integration required) and came up with a hummable ditty. Will Fudeman, an Ithaca singer/songwriter takes his tongue from his cheek long enough to sing his new song about what's coming down the pike for us in upstate NY. He begins, "Pardon me sir, I wonder if you might be willing to sign a lease. Your money troubles will cease..."
At least here in New York. I live in the southern tier, land of rolling hills and forests and hayfields. Underneath is all is the Marcellus Shale, a much-coveted resource that energy companies would like to convert from cold hard rock to cold hard cash. With so much potential wealth beneath our feet you'd think we'd be inundated with leasing agents. If it weren't for the DEC's year-long break to prepare a Supplemental Generic Environmental Impact Statement (SGEIS) we would be. 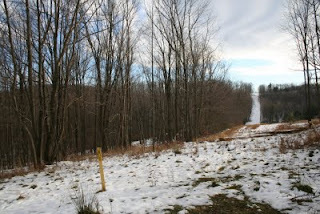 Still, even though DEC is not handing out permits for horizontal drilling in the Marcellus, they will soon. 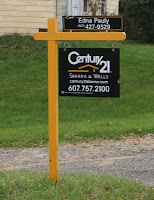 In fact, Fortuna Energy has 11 applications pending in our little town andn I am sure there are more on the way. Once DEC approves their final version of the SGEIS the land rush will begin in earnest. You see, to drill a well a company has to show that 60 percent of the land in the drilling unit is leased. What happens to those not leased? If their land falls within a drilling unit, their gas is taken through a process called "Compulsory Integration". Now some landmen, when they come to your door, speak of "compulsory integration" in much the same tone as "the goblins 'll get ya if ya don't watch out". It doesn't matter that you might not want to lease or have drilling anywhere near your farm or water well. What matters for the DEC is that they can assure that the mineral resources are extracted in the most efficient manner possible. So they pull you in kicking and screaming. Still, they do have some rules to protect you - er, to make sure that you receive "just" compensation for the extracted gas. And those rules are what compulsory integration is about. Basically they assure that a landowner will receive at least 12.5 percent royalty for gas removed. Maybe that was OK back in the 1800's when that rule was first written. But now, with landowner groups negotiating for 20 percent and higher royalties, the state's "protection" seems more like a rip-off. Well, say the gas folks, that's only the floor. The person who is forced - er, "integrated" into the unit will receive the lowest royalty on the unit leases. So if that's 20 percent, they're doing well. BUT given that many of the leases were signed when 12.5 percent was the "going rate" it looks like integrated landowners are screwed. Not so fast, say the gas folks. Landowners can choose to be "participating owners" in the gas well. That means you take on some risk - such as covering your part of the cost for drilling the well - but you receive 100 percent of the royalties. For your portion of the well. Or you can be a "non-participating owner". Instead of forking over the money upfront, you pay a "risk penalty" of 200 percent, plus your costs - a grand total of 300 percent - before you see any income. But hey, once the costs are recovered, you get to cash those royalty checks. There are some other options. One idea landowners have considered is incorporating as an LLC and leasing their land to their LLC. The royalty set-up is better, but at this point the insurance agents and lawyers don't seem to be too sure about liability issues. Some neighbors in the next town over had their own creative solutions to compulsory integration. You can read about it here. In a press release issued October 29, the U.S. House of Representatives approved a provision authored by Congressman Maurice Hinchey (D-NY) that formally urges the U.S. Environmental Protection Agency (EPA) to conduct a new study. The Senate is due to pass the identical bill in the coming days and President Obama is expected to sign the measure into law soon after that. Earlier in the week members of the Interior Appropriations Conference Committee, including Hinchey, signed off on the Interior and Environment Appropriations bill and report for fiscal year 2010 – the document containing the study provision. At a hearing before the House Appropriations Subcommittee on the Interior in May, EPA Administrator Lisa Jackson told Hinchey and others that she felt the EPA should look into the issue and review the agency’s policy. This is an about-face for an agency that in 2004 insisted that hydraulic fracking “poses little or not threat” to drinking water supplies. The 2004 EPA study is often cited by the gas industry whenever people bring up concerns over drinking water contamination. It also served as the basis for a provision in the Energy Policy Act of 2005 that exempted hydraulic fracturing from regulation under the SDWA. This meant that the oil and gas industry could inject hazardous materials directly into or adjacent to underground drinking water supplies without undergoing further regulatory review. Criticism of the 2004 EPA study started before the ink was dry. EPA’s own scientists said the study was “scientifically unsound” and claimed that data and reports showing problems with hydraulic fracturing were left out of the final document. The report also failed to address the fate of frack fluids left underground and toxicity of the fracking fluids and excluded data on vertical fractures or casing problems. Gathering Line - a special pipeline that transports gas from the field to the main pipeline. The Gathering Line is a round-up of oil & gas drilling news brought to you by National Alliance for Drilling Reform (NA4DR), a broad alliance of grassroots activists from states across the nation that are affected with drilling development. 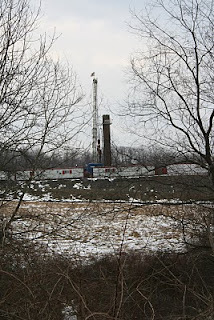 Peacegirl writes about gas drilling in Bradford County, PA. Welcome To Bradford County, PA, calls attention to an article in the Fall 2009 issue of Save the Bay, the magazine of the Chesapeake Bay Foundation which features the North Branch Susquehanna River in Bradford County. 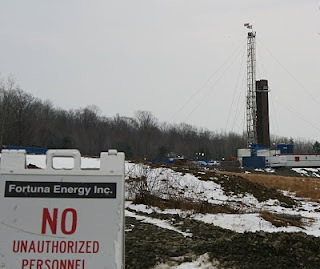 From the blog Gas Wells Are Not Our Friends where your comments are always welcome. Todayís environmental horrors could lead to a scary Sci-Fi future. Drilling Santa Fe offers an excerpt from Apocalypse Soon by Laura Paskus. Meanwhile, Splashdown says, Kiss myGas! Williams Petroleum wants to pipe drilling waste water under our homes in Flower Mound, TX to a huge tank farm. Flower Mound Citizens Against Urban Drilling we discovered an alternative that is safer and greener. Williams claims to be a "good neighbor." Here's their chance to prove it. It was standing room only (or close to it) in the James Law Auditorium at Cornell's Vet School last Thursday (Oct 29) when more than 200 people showed up for a forum on "Legal Issues for Landowners. 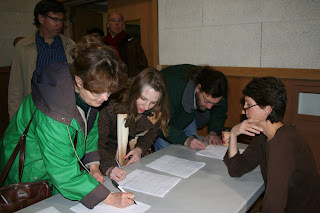 The forum was co-sponsored by Shaleshock Citizen Action Coalition, Cornell Cooperative Extension, and a host of others including local Assemblywoman Barbara Lifton. Four attorneys addressed issues of gas leases, property law, pipeline easements, compulsory integration, and landowner coalitions. One of the things that still seems to stymie landowners is that when they sign a lease with a gas company they could be creating a "title defect". "The severity of the defect depends on what you ultimately want to do with your land," said attorney Randy Marcus. A typical gas lease goes far beyond allowing the gas company to drill; they can build access roads to their well pad, take trees (timber), erect fences, put up buildings, and construct pipelines if you don't negotiate limits to these rights, Marcus said. He pointed out that most banks won't put a mortgage on a property with a lease. If a family purchases country acreage for their dream home, and the previous owner had leased the mineral and surface rights to a gas company, the home-in-the-country dream may not get financed. Another issue Marcus raised is homeowner liability and insurance. "Accidents happen," he said, and noted that a number of insurance companies will not insure properties with a lease. Others have substantially increased their premiums. While DEC's new draft rules for drilling the Marcellus (dSGEIS) takes up a lot of pages (809) it does "virtually nothing to protect the value of your property," said Marcus. Right now the gas companies can drill a well as close as 100 feet from your home. "That's five pick-up trucks parked end-to-end," Marcus said. "Not what the average homeowner expects in their backyard." Attorney Jane Welsh agreed with Marcus. Later in the evening she said that DEC "doesn't really have protection at heart" of their dSGEIS. She feels the environment is getting the short end of the stick and urged landowners to submit comments on the dSGEIS. She also emphasized the importance of conducting baseline water testing, in case well water becomes contaminated through drilling or spills. Attorney Helen Slottje addressed the issue of pipeline right-of-ways. The message of the night: there will be a lot of them, and nobody is coordinating where they go. Without some sort of oversight the pipeline right-of-ways will slice through forest and farmland. clarification: the discussion was in reference to gathering pipelines that go from wells to compressor stations and the large pipelines, such as Millennium, that transport gas to market. Slottje also raised the question: what would happen if landowners got together to create a coalition of folks who refuse to lease their land? To form a drilling unit a gas company must have 60% of the land under lease - they can incorporate any hold-outs through "compulsory integration" - more on that tomorrow. But, said Slottje, what if landowners joined in solidarity to keep acreage unleased? If they got enough acres they could effectively stop the drilling in their area. Between now and Thanksgiving the NY Department of Environmental Conservation is hold four - count 'em: 1, 2, 3, 4 - public hearings to collect comments on the 809-page draft Supplemental Generic Environmental Impact Statement, aka the dSGEIS. This document is focused only on horizontal drilling and hydraulic fracturing used to extract natural gas from Marcellus shale (and other shale deposits). They held their first hearing at Sullivan County Community College on Wednesday night, October 28. 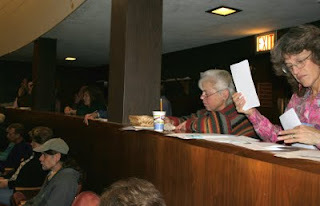 According to Liz Bucar, who blogs at Breathing is Political the vast majority of the standing-room-only crowd was opposed to drilling in New York State. She gives way more local color than the ProPublica gal; have fun reading. About 50 residents showed up to the Town of Owego Planning Board meeting last night (Oct. 27) to learn more about the Patriot Water Treatment LLC plans for recycling frack fluid. The planning board, which is the lead agency for this project, has the authority to approve or reject the site plan. Last night, after listening to the company's proposal and an hour or more of citizen comments, the board decided that they needed more information before making a decision. They gave Andrew Blocksom, one of the Patriot Water owners, a long list of items they'd like more information on by the next meeting. Seems like the biggest issue that both residents and planning board had was the lack of detailed information: What exactly is this process of cleaning up the frack waste? Where will the recycled water go? What happens if there is a spill or a flood? Will there be open pits (impoundments) holding frack fluid? And why can't we find your company on the internet? Aside from the fact that this company is new, and that Andy gave what he called his "kindergarten" presentation [and clearly not enough details to satisfy the locals and the planning board], what really bothered folks was that he constantly said that the frack waste was "not hazardous" and "not toxic". The other issue was the amount of truck traffic - 4 trucks/hour, 24 hours/day, 7 days a week - routed up and down a steep hill near through residential areas. "Why not follow the regular truck route through town?" asked one guy. Another wanted to know whether the planning board could put a route restriction on the trucks, and quite a few expressed concern about the taxpayers underwriting the road maintenance for repairs, as each truck will weigh something on the order of 80,000 pounds. So, where will this treatment facility go? On the site of the old Chevy dealership on Taylor Road. This is zoned an "industrial" area, and sure enough there are a bunch of industries there already: Sanmina, Lockheed, Moore's Tires and service center, a bowling alley, a wastewater treatment plant and a small electrical business. There are also four churches and a preschool within a couple minute walk from the site, and the nearest residence is a mere 500 feet from the edge of the pavement, where the frack tanks will be lined up - not 1500 feet as stated a week earlier at the county planning board meeting. As some folks pointed out last night, the area is already zoned industrial, and the idea of recycling frack waste sounds good; it might reduce the amount of water pumped out of the local rivers and streams. But, as the planning board said last night: there are a lot of unanswered questions. 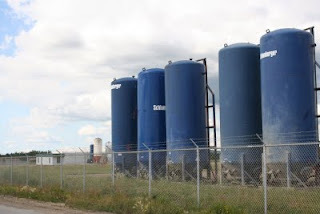 Frack Waste Treatment Plant in Owego? While I was deliberating budget matters during our town library board's monthly meeting, the members of the county planning board were deliberating whether or not to allow a frack-fluid treatment plant into the next town over. Somehow a draft copy of the Tioga County (NY) Planning Board minutes for the Wednesday, October 21 meeting ended up in my in-box; reading them was nearly as exciting as reading Harry Potter and the Chamber of Secrets. Patriot Water, LLC hopes to establish a treatment facility where the old Chevy dealership used to be. The business, they say, will treat hydraulic fracturing flowback fluid and transform it into "distilled water" which can be re-used by gas drillers for further fracking. It will also create a whopping 20 jobs. The treatment facility will store frack fluid and their treated water in tanks on-site. They plan to build an enclosed impoundment (pool) to store incoming frack fluid - lined with two 36-ml rubber linings and assembled using bolts. The real gotta-turn-the-page reading came with the comments. Andy Blocksom, the Patriot Water representative, insisted time and time again that the 200,000 to 240,000 gal/day of frack fluid they'll process is not toxic. "It's just water with a small portion of heavy metals and brine," he said - and we all know how healthy arsenic and cadmium can be, not to mention Radium 226 and 228, just two of the "Normally Occurring Radioactive Materials" (NORM) that are sure to be present in flowback from Marcellus wells. But, hey, DEC doesn't call this stuff toxic. They don't even call it hazardous. To DEC all this frackin' stuff is simply considered "industrial waste". On top of that, if there is a flood Patriot Water will simply stop accepting frack fluid and let what they've stored just "dilute and drain" with the floodwater - into the Susquehanna. My neighbor down the road is a farmer. Like most of the farmers I know she is down-to-earth, can fix just about anything, and practical. During a discussion the other day about landowner's rights to lease, she raised two good points: that a landowner could be held liable for damages that might occur to a neighbor's water should contamination from drilling occur, and the difficulty of selling leased property. Last spring I interviewed a few realtors in gas-drilling areas, asking them if they'd experienced any trouble selling properties. Dave Knudsen, a Sullivan County realtor with the Catskill Buyer Agency, said that during the summer of 2008 he fielded two calls a week from investors looking for "100 to 200 leaseable acres". "They were asking for land near the pipeline," Dave said. But his other clients, downstaters looking for a quiet country home, had other priorities. Their first question was: are the neighbors leased? If so, they didn't want to look at the land. Dave isn't the only one. A Finger Lakes area realtor said she had more than the usual trouble matching prospective home-buyers with their country dream house. One 32-acre parcel near Ithaca was rejected twice because of the lease. The second buyer even had a house package worked up for the land, but the bank denied him a loan because of an existing gas lease on the property. The ultimate buyer figured he could build a house before the gas company moved in to drill a well.